The lovely people at Plum have been kind enough to send us their new "Little Foodies" range of toddler meals for 1-3 year olds, to see what Jack-Jack made of them. Our first impressions were very positive - the packaging is attractive and clearly displays the key ingredients that are in the meals. It reassures parents and carers that they're giving their children the best food choices possible, when perhaps it's not convenient to serve home-cooked. The recipes are organic and are full of exciting flavours. Jack-Jack normally eats the same food as we do, even when out at restaurants, so it's been several months since he was regularly eating pouches of baby food. 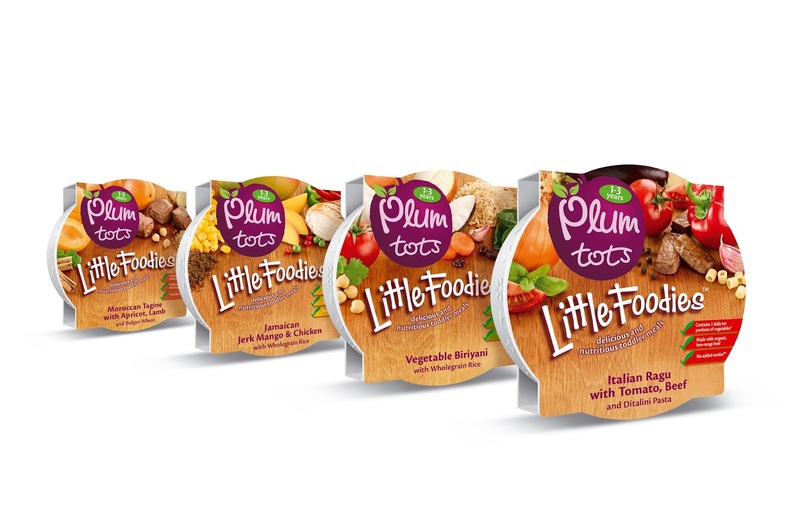 The exceptions have been when he's been poorly, teething, or if he's very tired - we've found that it's a quick and easy way of getting nutritious food into him without too much effort on his part! We usually keep a couple of toddler steamed meals in the cupboard for these occasions. We had the perfect opportunity to try one of the Little Foodies meals the day after Jack-Jack's birthday, as we'd had a picnic party in the park out with friends at lunchtime followed by a huge play, so Jack-Jack was ready for his bath and bed at teatime, but had worked up an appetite! I was slightly dubious about trying new flavours, as Jack-Jack has been known to completely refuse to try anything new if he's not in the mood, but I decided to go ahead and chose the Jamaican jerk chicken with mango. The pot was very large (as it would need to be to cover the 1-3yr age range), so I split it into two portions and popped one in the fridge. It smelled amazing - I was a bit jealous! Jack-Jack likes to look at, have a tiny taste, feel with his fingers and smell his food before committing to eating it, but it seemed to pass the test as he happily ate nearly the whole portion after examining it closely! There were whole peas, beans and pieces of sweetcorn to chew, and plenty of wholegrain rice. He finished off the second portion the following day - as it had been in the fridge for a day we decided to heat it up in the microwave, and Jack-Jack enjoyed it just as much warm as at room temperature. The clean up afterwards was easy, even though Jack-Jack had managed to spread the remainder all over the high chair tray and up into his eyebrows and hair, and I was pleasantly surprised that there were no orange stains on the high chair, bib or flannel after washing. Unfortunately the high cost of these meals (RRP £2.25 each) means that we wouldn't be buying them regularly, but we can definitely see a use for them and would consider keeping one or two in the cupboard for the odd occasion. We were sent the products free of charge for review purposes, but weren't paid for the review, and all opinions are our own.